Things are starting to get larger and bushier. There are a few tomatoes, more than a few cucumbers, and lots of promising growth. So far the rain gutter gardening system is performing exceptionally. No drips, and there is water always available for the plants. 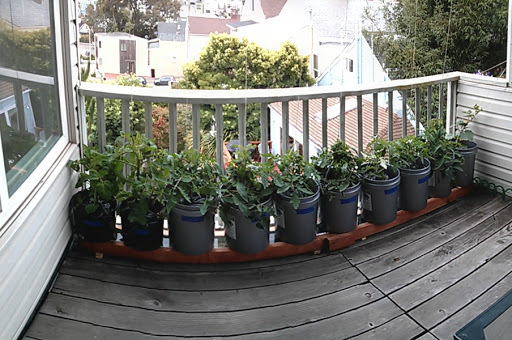 The cold & wind of San Francisco is making these plants grow super hardy, but healthy all the same. I think these plants would have been 2-3x the size if not larger if they were more traditional tomatoes in a more favorable climate.